It was with great excitement that I accepted an offer from the roller rink at Secret Garden Party to work during the festival, instructing and demo-ing. I had been wanting a ticket as a group of friends were going to the festival, but they had been sold out for weeks. When we arrived the site was very muddy and wellies were a must. As soon as our (hired) campervan was parked I headed to the festival to find the rink. 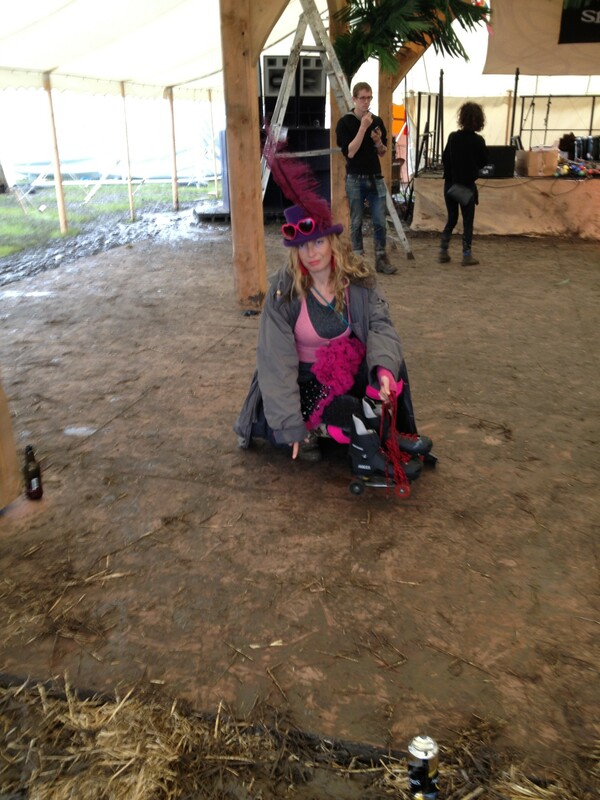 It was hard work to walk around in the mud and my quads skates in hand did produce some smiles and comments. When I arrived at the ‘rink’ I thought I was in the wrong tent as what I was looking at was a large marquee with a stage at one end and what looked like a wooden dance floor in front of it. However, it was covered in mud, straw and grime. When I had it confirmed that this was infact the intended roller rink, my first thought was “you’ve got to be kidding me”. I couldn’t contact any of the organisers for a report but when I arrived the next day for my first shift it was evident that the mud would not be cleaned up and there would be no skating. 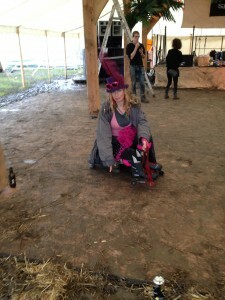 I was disappointed but had the mud not been the issue, the size of the space would have been problematic, it was tiny, so perhaps I was spared a situation which sounded good in theory (roller skating at a festival) but in reality might have been the hardest work. I had a wonderful weekend, relaxing with friends, dressing up, dancing, loving our campervan and the comforts it provided and the beautiful meals we produced. I have been a camping fan all my life but now I’m wondering if even my camping is going to be upgraded to having wheels….